TDmonthly Magazine’s Review Scout scours the Web weekly for reviews of new and hot products so you don’t have to spend your time searching. Out of thousands of blog, retail and other sites, his research uncovers toys, games and other gifts that are worthy of your attention now. Check this space for briefs on reviews and ratings from across the nation and even the globe. In light of the continuing economic crisis, financial responsibility is a hot topic. Many parents want to provide their children with good financial sense, but that can be a difficult subject. The Money Savvy Pig by MONEY SAVVY GENERATION and Moonjar Classic Moneybox by MOONJAR teach the basics of banking in a visually stimulating way kids readily embrace. See reviews on these and other products below. 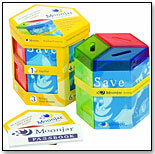 The Classic Moonjar Moneybox is a fun, new innovative way to help kids understand money. Made of three colorful, retro-tin containers and held together by a Moonjar Band. The red section is for Sharing and has lots of space for kids to place their own ideas about the people and causes they want to share with. The green section is for Spending and helps them visualize what they want to buy. The blue section is for Saving; encouraging both long and short term goals. Saving, Spending and Sharing. The Moonjar concept of SAVING, SPENDING and SHARING brings lifelong, life changing values to the families of today. This teaching tool is a hands-on, visual reminder that encourages the choices to be made with money. Moonjar has been recognized for meeting a global need with a clear uncomplicated tool. Moonjar is a positive step for financial literacy and children. This product won a National Parenting Center 2005 Seal of Approval. — The Moonjar Classic Moneybox uses three distinct sections labeled share, spend and save. Leanne of Rave & Review praised the fact that each compartment separated from the others; kids won’t overspend, for example, if they only take the “spend” compartment to the store. However, some reviewers were disappointed by the rubber band used to hold the compartments together. See also Metropolitan Mama. The Money Savvy Pig® is a four-chambered bank designed to help kids and their parents or grandparents begin a conversation about money. It is designed to help teach basic money skills by introducing four choices: SAVE, SPEND, DONATE and INVEST. "Its unique four-chambered design allows children to deposit their money through four separate slots on the top of the bank — one slot for each money choice — and empty each money chamber individually through the feet on the bank," Melinda Voelcker, director of operations and marketing for Money Savvy Generation, told TDmonthly. It is available in six colors. Awards: 2015 TDmonthly Magazine Top Toy Award; 2002 Parents' Choice Gold Award; 2008 National Parenting Publications Gold Award; 2008 Preferred Choice Creative Toy Award; and 2008 National Parenting Center Seal of Approval. Launch date: 2002. — As of 05/12/2011 this product had 4.3 out of 5 stars from 34 customer reviews on Amazon.com. Cons: Three customers reported that the bank broke when they dropped it. — The Money Savvy Pig is a traditional piggy bank on steroids. Instead of holding a child’s money in a single chamber, it utilizes four, labeled save, spend, donate and invest. Reviewers found that it works well with an allowance system. Trent Hamm of The Simple Dollar explains that even if children cannot completely understand the concepts behind the Money Savvy Pig, it can make it “so that saving seems like a completely natural thing.” See also 3 Garnets & 2 Sapphires. MusiColor™ Music Player by DELTA CREATIVE INC.
Other products from DELTA CREATIVE INC.
MusiColor turns color into music via an innovative music player and coloring discs. To produce a song, such as “Old McDonald,” children simply follow the coloring guide and color a disc with the included markers. When placed on the player, the fully colored picture of Old McDonald will produce a pitch-perfect rendition of the song. In addition to 14 template discs, MusiColor also includes five blank Create-a-Song discs for more open-ended play. — Bridgette of The Experimental Mommy called MusiColor a reinvention of coloring; by providing a reason to color within the lines, it fosters patience and attention to detail. Though some reviewers felt the detailed template discs were too difficult for younger children, Rob of Look What Mom Found felt that MusiColor’s greatest strength is its adaptability to a wide age range thanks to the blank discs kids can use to create their own colorful compositions. This soft doll is made of organic fabric and colored with vegetable dyes. Launch date: Fall 2009. — The My Natural Good Earth Fairy is eco-friendly inside and out; she is stuffed with organic cotton, wears a leafy skirt made from linen, and features rosy cheeks created with plants and minerals. Young girls love the Good Earth Fairy, and many of them were almost equally excited by the sturdy reusable cardboard gift box the fairy comes packaged in, turning it into a home for their fairy or a place to keep valuables. Reviewers found the doll well constructed and strong enough to survive their attempts to rip out its hair (all in the name of science, of course). Jodi Grundig from Mom’s Favorite Stuff felt assured by the doll, knowing its natural materials would not aggravate her children’s allergies. With a cute design, high durability, and environment conscious materials, the Mi Yim Good Earth Fairy is a winner with parents and kids alike. — "Excited to add this product to the other MiYim items we carry. Quality and packaging are top-notch," Marlene England of Dancing Bear Toys & Gifts, told TDmonthly at Toy Fair 2010. A cross-platform MMO game, Freaky Creatures allows players to build the ultimate, customizable creatures and then battle them against friends. The Freaky Creatures experience begins with a starter pack that includes 2 action figures and a 1 gigabyte reusable flash as the key to the Freaky Creatures universe with a random assortment of 50 parts, 20 powers and 4 lair objects that allows players to create more than 3 billion visual combinations. Booster packs add more to the customization. Once customized, players can enter the online world and interact with other players. — Freaky Creatures bills itself as “the first player-customized, cross platform gaming universe you can take on the go.” Do such grandiose claims match the product itself? In short, no, but this does not mean Freaky Creatures should be ignored. Each starter pack contains two of the titular creatures rendered in action figure form along with a flash drive that unlocks a MMOG with exploration, character customization, and a simple battle system. Reviewers report the figures are nicely detailed and painted, especially for their size. KidsTechReview.com proclaimed the game “surprisingly well done.” Jacqueline Rupp of Common Sense Media recommended the toy for children ages 10 and up (not the advertised 8+), praising the online component for delivering fun game play while avoiding violence and adult content. With irresistibly grotesque figures and a solid online game experience, Freaky Creatures has genuine appeal. It’s not for everyone, but it can be used to reach older boys who spurn tamer and more traditional toys.